Hurricane Patricia was poised to smite North America several days ago, remember, with some of the strongest winds ever measured? So what happened to that alleged "storm of the century?" Now meteorologists finally have an answer; when Patricia got close to the eastern seaboard, all the fatal shootings in Cleveland these days spooked her off, and she dissipated in the mid-Atlantic. So give our community a gold star there. Still, if one wants to celebrate the Halloween season this year in the inner-ring suburb with the fewest chalk-body outlines, the place to be is Ghoulardifest this weekend in Parma. Taking place at the LaVilla Party Center at 11500 Brookpark Road, the festival is three days of special guests, local TV and media nostalgia, and the Ghoulardi-grade brand of science-fiction, comedy, fantasy and horror cinema. without Anderson, who, as host of WJW-TV's "Shock Theatre," put on a garishly phony goatee and Fu Manchu mustache and spiced up B-grade horror and sci-fi flicks for insomniac viewers in beatnik-comic fashion for a few brilliant years there in the mid-1960s. The silver-tongued announcer, unrecognizable now, would do blackout comedy bits (some including a young sidekick named Tim Conway), sound effects, songs and the catchphrases. "Turn Blue!" "Ovaday!" "Dorrrothy..."
This last a dig at a co-worker, legendary local newswoman and author Dorothy Fuldheim, whom, I am given to understand, didn't "get" the hipster humor and didn't know what to make of the attention Anderson/Ghoulardi threw her way. That's why there's no FuldheimFest today. That that as a cautionary tale. young troublemakers were transfixed in front of the tube by their hero. neighborhood horror host. I've traced it to the late '50s for Sid Noel's portrayal of New Orleans TV horror host called Dr. Morgus. 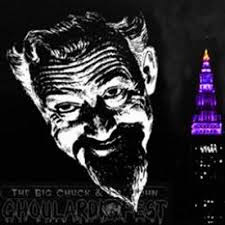 But there's no question of Ghoulardi's popularity, though Anderson himself (and Tim Conway) subsequently departed for Los Angeles and a successful career doing comedy LPs and voiceovers, most famously for ABC television. Anderson (who died in 1997) left his schtick in the respectful hands of successors Charles "Big Chuck" Schodowski and Ron "The Ghoul" Sweed, among others. memorabilia dealers, authors, pizza-eating contests, and more. Saturday night traditionally brings a costume party and contest. I remember one year there was a woman with her head stuck in a trick mad-lab getup in tribute to THE BRAIN THAT WOULDN'T DIE, who was an audience favorite, though I dug the two guys who had the Green Hornet and Cato down pat, complete with judo-stance poses. Musical entertainment include the Beatles tribute group the ReBeats and an Elvis impersonator. Additional local TV horror hosts Son of Ghoul, Janet Decay (AKA "Daughter of Ghoul") and the guys from the Midnite Movie Show are also listed as attending. Kids are particularly welcome at GhoulardiFest, which aims to be family friendly (and keeps them out of juvenile detention, in theory). Hours of GhoulardiFest are Friday, Oct. 30, from 5 p.m. to 9 p.m., Saturday, Oct. 31, from 10 a.m. to 5 p.m., and Sunday, Nov. 1, from 11 a.m. to 5 p.m. Admission is $15 at the door with a $30 weekend pass. For more information go to www.theghoulardifest.com.